SOS Children’s Villages is in need of child sponsors for its Villages in Sri Lanka. SOS provides long-term family based care for children in need and the funds raised through child sponsorships helps provide each child in our care with all the necessities of a loving, safe and healthy childhood. Canadian's wishing to help orphaned and abandoned children in Sri Lanka are encouraged to sponsor a child. Please sponsor a Sri Lankan child today. Child sponsors will receive a Canadian charitable tax receipt. After many years of civil war, the tropical island of Sri Lanka is now trying to get back on track. Tens of thousands of Sri Lankans were internally displaced as a result of the war. SOS Children's Villages has been helping children and young people all over the country to create their own future in a peaceful and positive environment. SOS Children's Villages has been working in Sri Lanka since the 1980s and is currently running 6 SOS Children's Villages which have a capacity to provide 760 children with a home. We support the population in many different ways: we give loving homes to children who have lost parental care; we strengthen families so that they can stay together; and we provide day care, education and health care. We have also initiated emergency relief programs as a response to natural disasters and conflicts. The Republic of Sri Lanka lies in the Indian Ocean. In the 14th century, a Tamil kingdom was established in Northern Sri Lanka. During the colonial period, Tamil labourers arrived in Sri Lanka to work on tea and coffee farms in the highlands, making the island a major tea producing nation. Sri Lanka was called "Ceylon" by the British and independence was achieved under the name "Dominion of Ceylon" in 1948. Ethnic tensions between the Sinhalese majority and the Tamil minority eventually led to a long-lasting civil war, which erupted in the 1980s. In 2002, after two decades of fighting, a cease fire was agreed upon and peace negotiations started. In 2009, violence between the Tamil Tigers and government forces finally came to an end. The war deeply affected the Sri Lankan population, particularly young children and adolescents. Tens of thousands of Sri Lankans are internally displaced as a result of the conflict. The 2004 tsunami left 40,000 dead and many more homeless. In 2011, hundreds of thousands of Sri Lankans were displaced as a result of massive flooding in the country's east. Poverty figures in Sri Lanka have declined significantly over recent years: while in 2006 roughly 15 per cent of Sri Lankans were facing a life in poverty, the figure fell to 8.9 per cent in 2010. Thus within only four years, the number of poor people in the country had nearly halved. Improved living conditions in rural areas of Sri Lanka have particularly contributed to the unprecedented poverty reduction. As poverty levels decline, so does inequality in Sri Lanka: the Gini Index, an indicator of inequality levels in a country, shows that income is now distributed more equally than a few years ago. Nonetheless, many Sri Lankans still live in harsh socioeconomic conditions where they lack access to basic services. Nearly one in five Sri Lankans is undernourished. Fighting poverty and all its side effects, including child mortality, malnutrition and a lack of basic amenities, remains one of the top priorities of the government of Sri Lanka. The HIV/AIDS prevalence rate in Sri Lanka is fairly low. Sri Lanka is a signee of the U.N. Convention on the Rights of the Child. Nonetheless, the child rights situation in the country leaves a lot to be desired. An estimated 900,000 children aged five to 17 engage in child labour activities. Almost ten per cent of these children work in dangerous and unfavourable conditions such as in mines, with chemicals, pesticides or dangerous machinery. Child labour is a common phenomenon among poor families: children are sent to work to support their parents. Many of these children are not able to attend classes and never receive basic education. Boys in rural areas are particularly affected. The government has increased efforts to eliminate the worst forms of child labour by 2016. An estimated 340,000 children in Sri Lanka grow up without either one or both of their parents. Very often, poverty is cited as the main reason why children end up without parental care. Infants are often abandoned because poor mothers are not able to care for their child. The civil war that affected Sri Lanka for so many years did not spare the youngest segment of population: many young boys were recruited for combat in certain areas of the country. Another problem in Sri Lanka is the number of child headed households: many mothers who have to migrate to other areas of the country for work have young children who end up heading the household at an early age. Due to the absence of their mother, these children are vulnerable to sexual abuse and exploitation. Very often, they are not able to attend school. The prevalence of underweight children under five years of age has declined noticeably and is now at 21 per cent. School enrolment figures have improved, showing that the number of children starting grade one is on the increase. 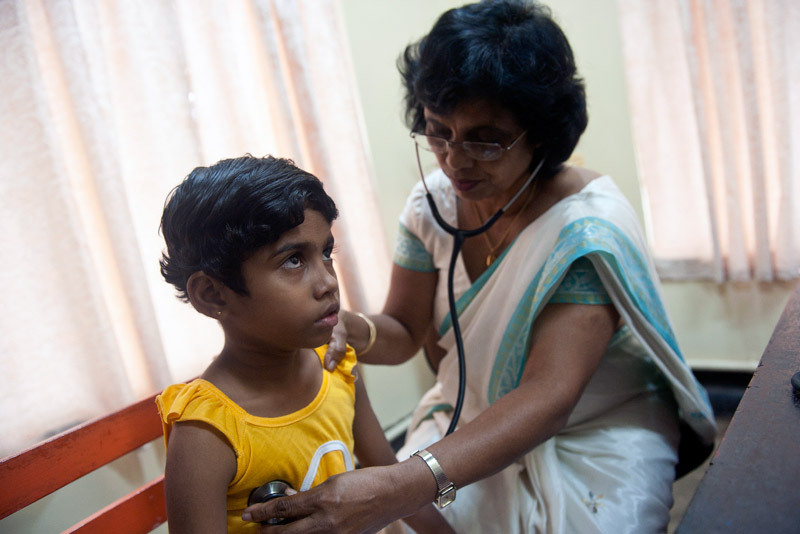 Over recent years, child health has noticeably increased in Sri Lanka. However, the country's infant mortality rate is still up at 9.70 per 1,000 live births - more than twice as high as for Germany.